Jim Hackett: "We're addressing some long-term issues, and we're going to do those in very thoughtful and orderly ways." 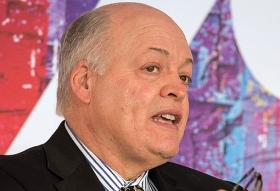 DETROIT -- Ford Motor Co. is preparing to cut an undetermined number of its 70,000 salaried workers globally as it implements CEO Jim Hackett's US$11 billion companywide restructuring. The automaker on Thursday began informing employees internally that it was reorganizing its salaried work force, but said more details, including which jobs will be axed and where, will be disclosed over the coming months. "It's really about redesigning the business," Ford spokeswoman Karen Hampton said. "An outcome of that is that there's likely to be reductions. The real purpose is to change the way we work." Hampton said Ford's salaried work force reductions will be complete by the second quarter of 2019. We are in the early stages of reorganizing our global salaried workforce to support the company’s strategic objectives, create a more dynamic and empowering work environment, and become more fit as a business," Ford Canada spokesman Matthew Drennan-Scace said in an email to Automotive News Canada. "We will announce more specifics at the appropriate time." Hackett this year announced the need for a global restructuring to help it turn around underperforming regions and improve profits in North America. Separately, Ford this year upped its five-year cost-cutting goal to US$25.5 billion, US$11.5 billion more than it originally forecast. Ford at the time said nearly half of the cuts would be in sales and marketing -- through incentive optimization, reduced advertising and other actions -- with the rest coming from engineering and product development, material costs, manufacturing and information technology, in that order. Outside Ford, and among some within it, there is mounting impatience with Ford shares trading just above US$9 and the vagueness of the vision that Hackett has articulated thus far. Ford shares fell 0.33 percent to close Friday at US$9.12. "We're addressing some long-term issues, and we're going to do those in very thoughtful and orderly ways -- not chaotic ways," Hackett said in an interview with Automotive News last month. "We're not in a crisis. The company's in great shape."